You Can Join the Stamping Fun! I had a blast yesterday stamping with my friends and fellow TAC team members. My wonderful up-line/mentor, Marisa Alvarez, was in town yesterday. She met with me and my team member, Darcy Cooper, along with two of my dearest friends for stamping, training and encouragement. It was a wonderful day and we got so much accomplished. Our projects were Halloween themed. I will be showcasing them over the next few blog, twitter and facebook page entries. This card was one of my projects. I absolutely LOVE this hostess set, One of a Kind. I couldn’t resist making her into a little monster. The inside of the card says, “Happy Halloween”. I also used the spider from Happy Haunting. And added Stickles to the spider and her hair bows to make them stand out. I colored her in using Copic Caboodle markers. You just have to try these markers. I never liked to color with markers until I got my hands on these. They blend so beautifully. If you’ve ever thought of joining The Angel Company now is the perfect time. Now through September 30th you can purchase the starter kit for $75.00!! The regular price is $150.00. That is a 50% savings! It is a wonderful business opportunity. Call or email (kandy@kandyskeepsakes.com) me with any questions. 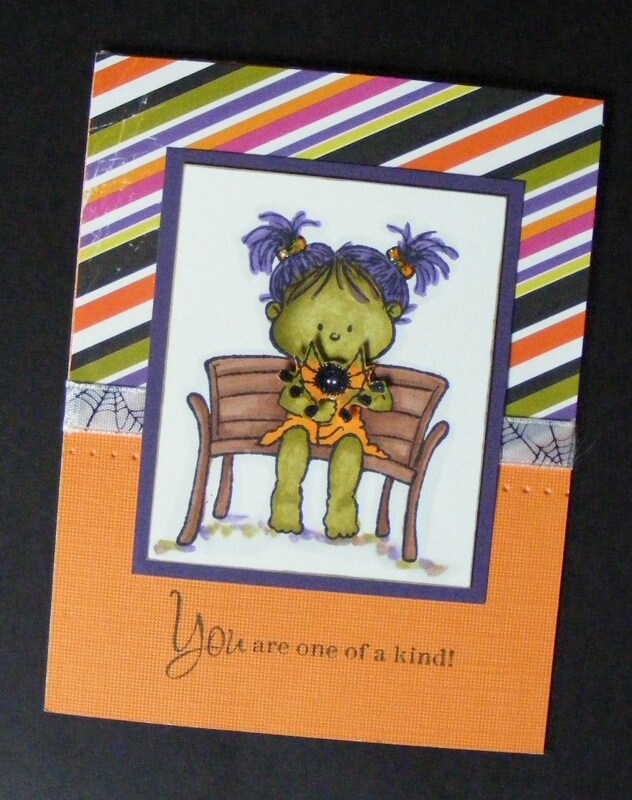 This entry was posted in Cards, Rubber Stamped Items and tagged Be an Angel, Halloween, Stamping, The Angel Company. Bookmark the permalink.